A couple of months ago Paul started getting severe back pain and sciatica from a bulging disc. Several visits to the doctor, pilates, physio, medication, a scan and a cortizone injection later he has improved, but in a ‘wait and see if this lasts’ way. As the weeks passed, with Paul unable to sit let alone drive, it became pretty clear that some of our plans for the rest of the year had to be shelved. Then a few weekends ago I drove us to a family birthday celebration, with Paul lying on the passenger seat with the back fully down, and after two hours driving on roads that seemed to constantly require gear changes plantar fasciitis reared it’s ugly head again. So suddenly neither of us could drive. At that point I either cancelled, or warned of likely cancellation, everything else on the calendar. And that’s also when I decided to try online grocery shopping. Which has been… interesting. I didn’t want to shop with Coles since they deliver orders in plastic bags. Finding online stores that use minimal packaging took a bit of googling, but I soon located a bulk store a few suburbs away and a grocery store with a policy of avoiding as much plastic as possible. Fortunately Paul can now drive for short trips, and I’m tentatively driving his car now and then, which is an automatic so at least my left foot gets a break. We’re both hoping life will get back to normal soon, but only very cautiously committing to outings. You’d think I’d be getting lots of craft done, but I’ve done almost nothing. This is because I was doing the household tasks that Paul usually does and taking him to appointments. But it’s also because shopping at online stores and watching the War on Waste second season had me trying things like cooking up and freezing beans and lentils and making beeswax wraps. And it’s birthday season in my family. And there has been some house and garden work happening, too. And I am chasing a work deadline as well as dealing with lots of little publicity tasks for the paperback release of my last book. It’s amazing how tired you can be at the end of a day spent avoiding being on your feet. Which I have to say, I’m not managing to do as much as I should be. Some years ago, I started culling my wardrobe thanks to Trinny and Suzanna. Every Christmas another book would come out, which made for an easy present for Paul to get for me, and I’d be inspired to review my clothing and remove anything that didn’t fit, suit or thrill me. To their credit, Trinny and Suzanna urge you to have clothing swaps or donate clothes rather than toss them away. In those days a lot more clothing was made of natural fibres that would rot away eventually, so the last resort wasn’t such a terrible thing. Since then the level of ruthlessness with which we are being urged to employ in our decluttering has increased. For a time there The Life-Changing Magic of Tidying Up was being quoted everywhere. I finally caved and read the book recently, and I couldn’t help thinking: “this woman is nuts!” even as I saw how her methods would work for a certain kind of person. Decluttering is big business. You wouldn’t think so, since it’s about having less stuff. But the harder decluttering has been pushed, the more I’ve suspected that customers are being encouraged to chuck out and reorganise stuff because they will more than likely replace it. When the ‘capsule wardrobe’ idea became fashionable it didn’t surprise me that clothing brands were instantly behind it. Most people aren’t that minimalist, and brands only stand to gain if you toss all your clothing and buy a whole new co-ordinated set. The words: “Decluttering is the conceit of the affluent” popped into my head a few years ago. Only people who can afford to buy too much stuff wind up compelled to declutter, and can afford to replace belongings if it turns out they actually need or miss them. Only affluent people can afford to buy snazzy storage to put their stuff in. What I found most disturbing about the Marie Kondo book was the idea that you put everything you cull into rubbish bags and toss it. The lack of consideration for where it ends up afterwards tainted the book with a selfishness that repelled me. But then, how to get rid of possessions ethically is a huge and difficult subject. One of the saddest discoveries I made when looking into ethical fashion was that so much of donated clothing still ends up in landfill. The sad truth is, so many belongings are being culled these days that not even desperately poor people in third world countries want or need our castoffs. And my assumption that good furniture put in the hard rubbish would find a new home dissolved when I saw antique chairs tossed into the back of a truck and crushed. What to do. Well, I say… Be a Maximalist! – Use your stuff until it falls apart. – Alter your stuff. Refashion, dye, repaint, adapt. – Play with your stuff. Look at your photo albums. Try on different combinations of your clothes. Use the good crockery set. Wear your jewellery. Use the time you’d have spent culling on finding new ways to use your stuff. – If you’re the Instagram type, be creative with your stuff. Make arrangements and take photos. Draw your stuff. Write about it. If you love the idea of a capsule wardrobe, make one out of what you already have. Make several – one for work, one for home, one for travel, etc.. Then you have the benefit of having easy decisions on a work morning as well as something different and fresh and more suitable to wear when the weekend comes. I am a maximalist, but I do cull. I’m not saying you should hold onto things you don’t want. But don’t let the fashion for minimalism blind you to the possibilities and benefits of keeping things. There is nothing wrong with being a maximalist if it does you and others no harm. It may actually be better for the environment, and in the long run that’s better for everyone, including you. Over the last two months the itch to knit something warm to wear led to a dyeing session, machine knitting two large garments, buying two circular knitting machines, realising I don’t have much yarn for them, stash busting and culling, unexpected weaving projects and finally, a good bit of stash enhancement. – I have a blanket to weave and sampling to continue. – The guild has some events coming up I’ve volunteered to help with. – I want to make the green hat to match the Green Lines Jacket. – Now that I’ve re-familiarised myself with the Bond I’m tempted to see if I can remember how to use the Passap, and make some socks. Looking further ahead, I have some mending and sewing lined up. I want to get a mosaic clock finished by summer. 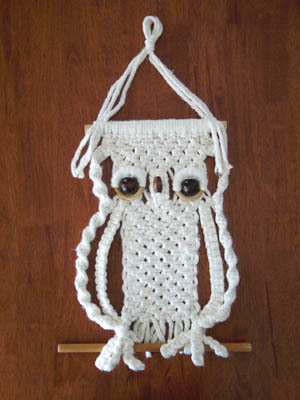 When my next writing deadline is behind me I’d like to try submitting a weaving pattern to a magazine. And then there’s just life stuff. Lots of birthdays. Maybe a short interstate trip or two. Lots and lots of weeding through Spring. Crafting has been limping along here lately. My back has been playing up, so I’ve only got a little bit of each WIP done and work has the highest priority when it comes to time spent on the computer. I should soon be able to get a post done about some portraits I finished recently, though. I’m getting a little scared of 2019. There are so many opportunities cropping up for cool stuff happening next year. And it’s only May. On top of that there’s a couple of ambitious projects I’ve come up with all by myself. I know I can’t do it all. The first half and the last few months of next year will be hectic, work-wise. I can do a few other things around that, but not everything I want to do. I need to choose. Or maybe let circumstances choose for me. Hmm. Late last year I came to the conclusion that I was addicted to my phone. Gosh, that’s a statement that would have made no sense fifteen or twenty years ago! Earlier in the year a friend had shut down Facebook for three months because she was spending all her time there and not interacting with her family. Ironically, this is the same friend who insisted I sign up because I’d be left out of social events otherwise. At the end of the three months she reactivated her account. She said it didn’t make a lot of difference, as she had spent the time she used to waste on Facebook in other apps on her phone. It seems like the phone is the problem, I thought. After eye surgery, while I was sensitive to light, it became really obvious that I spend too much of my time looking at screens. I’d wake up and check my phone, get up and shower, look at my phone while eating breakfast, sit in front of the desktop computer, check my phone in every break, settle down at night to watch tv and check my phone during the ad breaks or if the show was boring, then go to bed and listen to podcasts, read on the phone and, most often, look at social media before going to sleep. If I put my phone out of my reach at any of these times of day, I’d find myself reading for it without thinking. If I set it down next to me and told myself I wasn’t going to look, I’d find myself scrolling through Facebook minutes later. That sounds like addiction to me. Was this a bad thing? I loved my iPhone when I first got it. It replaced my watch, diary, Melways, notebook, book, torch, ipod Nano and camera. It connects me to the world and my friends. But was it having a detrimental effect, too? Like my friend, I tended to blame the apps for making me anxious or distracted. I hate the nervy feeling that I’ll lose friends and become dangerously uninformed if I don’t keep being a slave to social media. After a few weeks I noted I was feeling calmer. I fall asleep faster and have had less and milder insomnia. When I wake in the morning I think about the day ahead and make plans, and don’t forget what they were so easily. And the memory improvement was the most surprising. I realised that by stuffing phone use into all the little gaps of time between activities I wasn’t allowing my brain time to remember the small things. Letting it meander before sleep and rising, or during breaks, gives me time to not just recollect, but to see the big picture, rather than bouncing from one thing to another without an overall sense of priority. Also, my subconscious isn’t waking me up through the night to remind me about things I need to do as often as it used to. I’ve also noticed that friends really do expect me to be checking the phone constantly. It’s not so much that they want answers to questions straight away, but that they leave decisions that might inconvenience me to the last moment, expecting that a Message will reach me instantly. Nobody rings when it’s urgent any more. Another advantage of putting the phone out of reach is I’m not being constantly bombarded by advertising. Oh, such a relief! Which has had me thinking… These new devices that you can talk to in your home… How long before they begin to chirp advertising at you? Because the ploy of social media was to get people to think they can’t live without it, then slowly introduce the ads. How long before your internet-connected kettle and washing machine are telling you what coffee or laundry powder to use? Now there’s a nightmare of a future. Maybe I shouldn’t be spending all that extra time thinking! My craft/art aims for 2017 were to paint more, try new weave structures, and dabble in other hobbies. Yeah, I did all of that. The first I managed because I held weekly art nights in January and February, and then monthly ones for the rest of the year. The second was achieved by doing the workshop with Kay in June. The third included trying basketweaving and mosaics on top of my usual secondary hobbies. In January I started the Photo Album Project, finishing the redo of my earliest album and all but the captioning of the 80s to 00s album. I still have lots to do for this, especially the holiday albums. I made the Graduation Blanket, Pinwheel Tea Towels, Waffleweave Blanket, and Greenery Blanket. I finished the Denim Braided Rug, wove some fabric for the Tapestry Bag and a double weave blocks sampler. At the Ballarat Fibre Forum I learned to weave Summer & Winter. I went on a leftover warp using jape and made the Ikat Leftover Scarf, Scarf of Leftover Colours, the Plaited Twill Scarf, and the Falling Feathers Scarf, and then a thrum using jape and made Thrum Dishcloths, Spring Sampler Scarf, Anaesthetic-Brain Scarf and Thrum-Fringed Scarf. 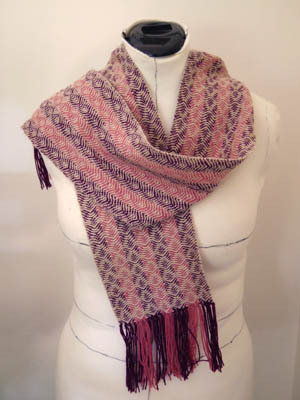 And finally there was my experiment with the Vari Dent Reed, producing three scarves. Loomwise, I tweaked the design of my Katie Loom, adjusted the height and pedal position of the floor loom and made laser cut heddles for my Vari Dent Reed. I tried basketweaving at the Guild’s Summer School. But I eventually lost enthusiasm for it due to the non-spontaneous nature of the craft (because you have to pre-soak the fibre) and the wear and tear on my hands. 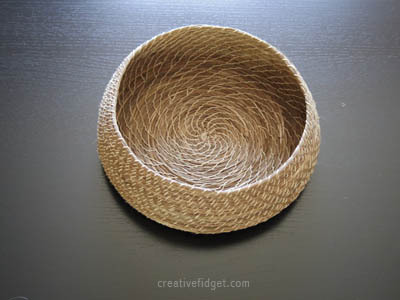 I can see myself using non-soak-requiring materials to make baskets in the future, however. 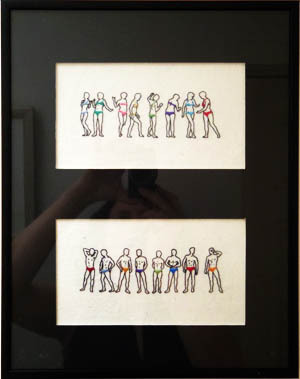 For the Fibre Forum in Ballarat I stitched some embroidery artworks to sell for charity. Including a pair I liked so much I decided to keep them. I’ve not had the courage to try embroidery since eye surgery. 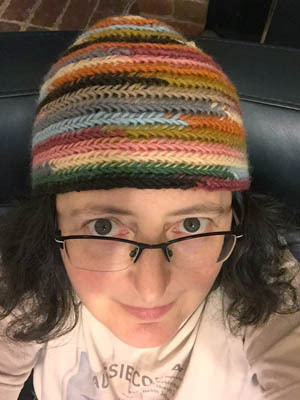 I made a too small Viking Hat, then got the sizing right for the Tapestry Thread Hat, and the Graduated Nalbinding hat. Paul and I turned an organ into a bar. 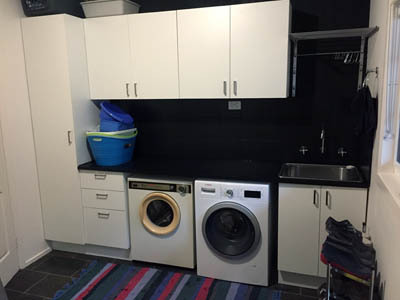 We also renovated the laundry ourselves. 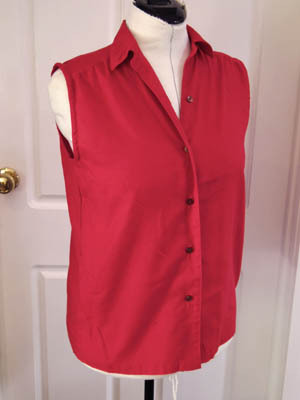 I had sessions of refashioning early and then later in the year, getting heaps of garments made, fixed or tweaked. I did a workshop at Bulleen Art and Garden, and was hooked. 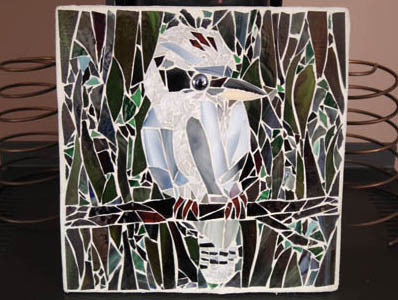 Aside from the Kookaburra I did there, and the mirror mosaic kit from Bunnings, I went on to make patches for the ventilation holes in the bathroom and entertainment room, and then two mosaic spheres. 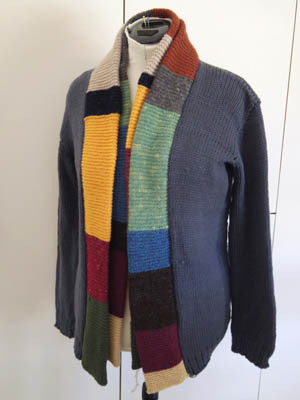 I did only one project – the Scarf Jacket. An artist friend came to stay and we made concertina sketchbooks. Just before Christmas I made a couple of new pieces. Of course, this list doesn’t include partially finished or abandoned projects, like the fabric I wove to make a skirt from, the mosaic clock I started or the longstitch embroidery I added dinosaurs to but disliked and threw out. Nor have I included all the gardening I did. I’ve left out artwork, too. I’m going to do a separate post on that. Looking at all these things I made, I’m pleasantly surprised at how much I got done, especially of weaving. It wasn’t because I took five months off work. I did less craft than usual in that time – just the mosaic and weaving workshop. All my creativity went into home DIY and renovation projects, and gardening. Setting achievable goals for the year worked. I had a secondary goal of making clothing from handwoven cloth, that I’ve partially achieved (the weaving part mostly, but also a little sewing). Of the new things I tried, basketry was fun but it was mosaics that really got me hooked. I won’t be attempting to learn new crafts next year, but I will continue to try new weave structures and I’m organising a weaving week with a tutor for a small group of weavers for early next year – the first time I’ve tried something like that. I have an art project in mind, too. Overall, my craft/art aims are pretty much the same as those for 2017: paint more, try new weave structures, dabble in other hobbies. Last week I wrote a long post about the garden. It’s looking pretty good and I’d been inspired by a book and a visit to a famous garden. All I needed to do was take some photos and I’d be ready to publish. The laserlite roof of our deck is full of holes, and there’s a mysterious leak in the toilet ceiling. Those are both being handled by the insurance. But the flood of water runoff from the neighbour’s tennis court that washed out part of the embankment and flooded the kitchen garden and studio is another matter. We’ve soaked up all the water in the studio with old towels and ran the aircon for a day to dry it out, and there doesn’t appear to be any damage. But preventing this happening again isn’t easy. Water runoff from the neighbour’s tennis court has caused problems before. The main event happened a few weeks after we moved in, over three years agao, washing mud and mulch into our pool. We paid for a pile of drainage work to be done in to prevent it happening again, and that seemed to be working. But dirt has washed down from the neighbour’s place and silted up the drain. I called the neighbour on the night, an they came over with extra old towels and looked at everything. They’ve promised to get advice and a quote to fix things on their side. They want to wait until we get permission to connect to the sewer, so whatever needs doing can be done at the same time. We’ve dug and raked back the silty dirt that’s washed down (which has given us a pile of free soil to use elsewhere, so there’s a small up side at least). I’m considering putting a second retaining wall in to try to draw away the water. But there’s no guarantee anything we do on our side will work if the neighbour doesn’t sort out their drainage. If it doesn’t and we’re not at home, it’s bad news for our studio. Paul is raising the cupboards and filing cabinets up on pavers. I can’t help thinking we should just brick up the back door, where the water came in, and raise the level of the floor, but it’d be expensive and mean emptying the studio. We’ll just have to see what, if anything, the neighbours end up doing. And hope we’re home next time we have a big storm. I read the above quote in a book written by a guy travelling in South America (which I gave to a friend so I can’t look up the source). In the book, the guy used it to explain his obsessive diary-keeping. It struck a chord with me. 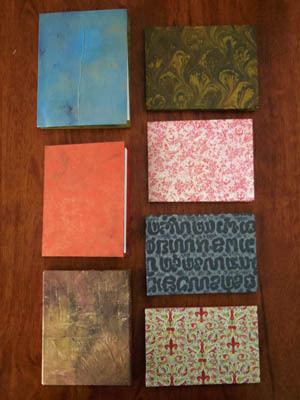 I kept a hardback journal when I was a teenager but in my late teens lost the habit. I’ve attempted to start one again from time to time, but stopped either because I was appalled at my own whininess, or I was simply too tired at the end of the day to remember to write in it. It’s only when I travel that the enthusiasm for recording the day returns, enhanced by the fun of sketching. For over a decade I had a scheduling diary for business use. It’s proven invaluable over the years as a store of information on when and where or how long I did things for. I also started a writing diary on my computer way back in the 90s, in which I get whatever is crowding my mind out before concentrating on the story, or brainstorm ideas. And then there’s online journalling. I had a LiveJournal back in the day, then started this blog. If anybody ever decided to compile a biography, they’d probably curse me. So. Many. Sources. But maybe a biographer would be pleased there are sources at all. Still, I think it’s more likely they’ll be someone needing to speak at my funeral and will have a lot of blather to trawl through to get to appropriate information. Lots of irrelevant detail, like craft projects and taking the cat to the vet. To be honest, I don’t particularly want to narrate my everyday life, but every time I go back to my old scheduling diaries I wish I hadn’t stopped using them. I can’t rely on my memory to work out when I last had a mammogram or visited an interstate friend, for instance, but that would have been noted if I’d kept using diaries. The phone’s calendar app is useful because it has an alert to remind me of appointments, but otherwise it’s not that great. It once deleted all my old entries, and the month view shows only one dot/event per day. Way back when I first bought a smartphone, the realisation that it could lighten my handbag considerably – replacing the camera, diary, notebook, book, torch and more – delighted me. But I’m finding myself missing the reliability (not to mention the privacy) of the physical versions. Like with travel documents, the safest approach is to keep a copy in both realms, so we’ve never abandoned using a wall calendar. I’ve bought a little scheduling diary for next year. It cost me $1.50. I’m thinking of getting a little notebook, too. I don’t know if it’s disillusionment with flawed digital formats, or I have nostalgia for the old way of doing things, but lately I’m missing the reliability of pen and paper. Or maybe I’m starting to fear the tide of forgetting.